Zimbabwe's authorities have freed MDC official Roy Bennett from custody, a day after the country's Supreme Court ordered his release on bail. Mr Bennett said Zimbabwe was a country "where the rule of law means nothing". A nominee to be deputy agriculture minister in the unity government, Mr Bennett was arrested last month on the day ministers were sworn in. He was charged with plotting terrorism, possessing arms for the purposes of banditry, terrorism and sabotage. The case raised tensions in the new unity administration, formed last month, with Movement for Democratic Change (MDC) officials accusing President Robert Mugabe's Zanu-PF of trying to derail a power-sharing arrangement. Dozens of MDC supporters cheered as Mr Bennett emerged from jail in the eastern town of Mutare on Thursday morning. He told the BBC he was ready to work under the unity government but added his immediate future in Zimbabwe was uncertain. Zimbabwean reporter Brian Hungwe says it is not clear whether he will now take up his ministerial post. "I could be re-arrested at any time, there could be attempts of my life," he said. "I have no idea. "You are dealing with totally unpredictable people and a nation where the rule of law means nothing." He added: "I bear no grudges and I have certainly forgiven those that have done it. "And I have prayed in their name that they may be forgiven for the state of affairs there is." After weeks of legal wrangling, on Wednesday Supreme Court Chief Justice Godfrey Chidyausiku - who is seen as an ally of President Mugabe - ordered Mr Bennett's release on $5,000 (£3,600) bail. The judge also tightened bail conditions, ordering the politician to report to a police station three times a week and surrender his passport and title deeds for his house. Gugulethu Moyo, a legal expert on southern Africa at London's International Bar Association, said Mr Bennett's release was probably only possible with the government's approval. She said there was significant political pressure on Zimbabwe's judges and the government had a habit of disregarding any independent ruling it did not like. 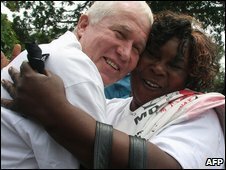 The lawyer told the BBC's Focus on African programme: "It's difficult to think that Roy Bennett has been released purely on the basis of the law because I think that it's been very clear that the charges against him are politically motivated and the way in which he has been detained so far suggests that. "So it does appear someone in the executive - you know perhaps this new government whether it is with the new prime minister and the new president - has at this point decided that Roy Bennett can be released and this is why it has happened." Earlier this month police arrested a magistrate, Livingstone Chipadze, after he ruled Mr Bennett should be freed. A white farmer whose land was seized under Mr Mugabe's land reform programme, Mr Bennett has been an MP since 2000. He was jailed in 2004 after pushing a minister in parliament during a heated debate about land reform. After being accused of links to an alleged plot to kill Zimbabwe's veteran president in 2006, he fled to South Africa, saying he feared for his life. He is due to make a remand appearance at Mutare magistrates' court on 18 March.